Waco glider Y was posted missing in Operation Ladbroke. A recently discovered Italian report has the details: Y’s men were captured and interrogated. Bayonets were brandished, executions threatened. 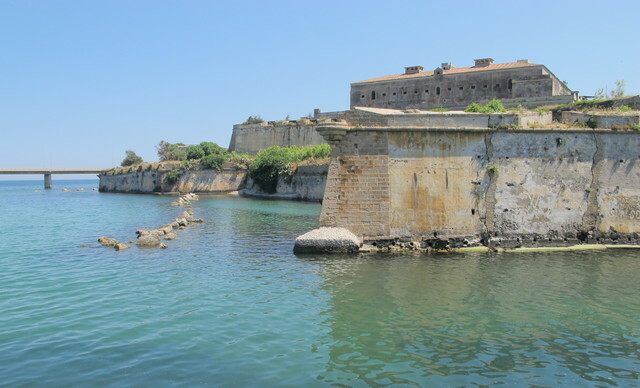 The citadel at the northern tip of Augusta, guarding the bridge to the Sicilian mainland. British intelligence was told it was a prison which was capable of holding 30,000 inmates. Tug: Albemarle AC, P1557, 296 Squadron, 38 Wing RAF. Takeoff: Est. 20:00, actual 20:10, 9 July 1943. Priority 21. Airfield: Airstrip F [map], Goubrine II, Tunisia. Tug return: Estimated 01:21.5, 10 July 1943. Glider allotted Landing Zone: LZ 2 [map]. Glider carrying: Sub-sec of 9 Field Company Royal Engineers, 1 Air Landing Brigade, British 1 Airborne Division. Troops’ objective: Help capture and then defend the outskirts of Syracuse [map]. Glider pilots: Sjt Pearson & Sjt Curry. There was no official report by either glider pilot, as both men were missing at the time of debriefing. As late as 1 August, a glider pilot back at base in Tunisia reflected ruefully in his diary on how many of his comrades had been killed in Sicily. The list included “Jimmy Pearson and George Curry”, whose glider, he believed, had been “hit by flak and blew up”. Glider Y was officially reported as missing. Although unknown at the time, the glider had in fact been released not near Syracuse, its destination, but near Augusta, which was miles up the coast to the north. Other tugs and gliders had also made landfall near Augusta, all apparently blown off course by gale-force winds. The night-time navigation problems posed by the weather were then further complicated by the cape south of Syracuse [map] (the intended release zone) looking similar to the cape east of Augusta [map]. Both towns had naval ports which were heavily defended by clusters of AA batteries and searchlights. Apart from the glider pilots, the men in Glider Y were a sub-section of 9 Field Company Royal Engineers (9FCRE), one of the units in British 1 Air Landing Brigade (1 ALB). 1 ALB was the force being deployed in gliders in Operation Ladbroke (Ladbroke was the codename for Syracuse town). The operation was the opening move of Operation Husky, the Allied invasion of Sicily. 1 ALB’s job was to clear and hold the road from the invasion beaches through to Syracuse, and then capture the outskirts of the town. This was so that the seaborne forces could capture the town and its vital port as quickly as possible.
. handcarts over canals if brs are found to be blown.
. (ii) Booby trapping bldgs.
. (iii) Assist in preparation of bldgs for defence.
. other tasks are finished). 1 BR never reached Syracuse, because so few gliders had landed near their landing zones, with many landing in the sea [story]. The closest the glider troops came to Syracuse on the night of 9/10 July was the Ponte Grande bridge [story]. The island of the old town of Augusta seen from across the Gulf of Xifonia, with the port’s harbour and the Sicilian mainland hazily visible beyond. Glider Y came down in the sea somewhere off Augusta, possibly in this bay, which resembled its intended release zone. Years later glider pilot Jim Pearson, the first pilot of Glider Y, wrote an account of what happened. It appeared in the December 1989 issue of The Eagle, the magazine of the Glider Pilot Regimental Association. He recounted how, early on in the flight to Sicily, the intercom connecting Glider Y to the tug failed, so they could not communicate. Once they reached Sicily they flew up the coast for much longer than they should have done, until finally the tug indicated he thought Pearson should release. He disagreed, but could not say so. Inexplicably the tug turned away, its station-keeping lights went out, and it dived “like a bat out of hell”, at a speed greater than the glider could cope with. Pearson and Curry struggled together with the controls, which were locking up from the speed, and were about to cast off when the tug levelled out. Pearson gave credit to the tug pilot’s courage, as the tug now flew back at low level into Italian AA fire to make another pass. The tug flashed a “release or I’ll release you” signal, so Pearson cut free (see here for the story of the debate about tugs forcibly releasing gliders). As the glider soared up after release, a stream of tracer bullets sliced past beneath the glider, and troops in the back reported seeing a German Junkers 88 night fighter shoot past. Luckily, it did not keep up its attack. The glider was also under fire by Italian AA. Pearson does not record that the glider was hit, but regardless, it had been released too far out and it landed in the sea. The ditching was successful, and all the men got out. A sapper dived repeatedly into the mostly submerged glider and managed to retrieve a coil of rope. Searchlights periodically crisscrossed the bay and machine guns fired on the glider, forcing the men to submerge for protection. They began paddling, trying to push the glider towards the coast. Eventually they abandoned the sinking glider and struck out for the shore, the stronger swimmers using the rope to help along the weaker ones. Finally they crawled out exhausted onto a beach, before starting to walk northwards. If they had landed where they were supposed to, this would have taken them towards Syracuse. As it was, they were headed directly away from Syracuse and away from British forces. At dawn, despite trying to hide in scrub, they came under rifle fire. Pearson said some men threw stones (which he thought the Italians momentarily mistook for grenades), but the men of Glider Y were soon taken prisoner. It was only after their capture that they realised they had landed near Augusta, not Syracuse. Much later Pearson escaped from a train taking him to Germany. Unfortunately (from the point of view of having more details about the interrogation of the men of Glider Y), Pearson says nothing else about his imprisonment. By 11 July, the day after their capture, the prisoners from Glider Y had been transported miles inland to the HQ of Italian XVI Corps at Piazza Armerina [map]. An intelligence officer, possibly from Italian 6 Army HQ at nearby Enna [map], was sent to interrogate them. He found 15 British airborne troops, including the 12 engineers of 9FCRE and the two glider pilots from Glider Y. This confirms that everybody on the glider survived the landing in the sea. In his report he recorded that the men had been captured by men of the Napoli Division, a regular army unit whose 76th Infantry Regiment (among others) was stationed near Augusta (see here for an account of the 76th in the battle for Augusta). The interrogation report recorded that the glider had been hit by AA fire and was forced to ditch in the sea. It said the men were equipped with life belts inflated only by blowing, and had swum ashore, but, having no weapons, had surrendered voluntarily. It said that all the POWs had extremely high morale and that to a man they had declared they would not reply to the interrogator’s or anybody else’s questions. Some men refused to give their age, place of birth or details of their parents, although many did (presumably in the hope that news of their survival might travel quicker to their families). They all said they would be liberated within days by their own invading forces, who would surely win. All the men refused to say where the bases were that they had flown from. However one sapper of 9FCRE had failed to check his pockets properly before flying, despite injunctions that nobody should carry any identifying material into battle. The Italians found three paper chits which had survived hours of immersion in salt water by being inside the sapper’s wallet. These entitled the bearer to be transported to and from Mascara in Algeria, at one time the HQ of British 1 Airborne Division. The points of departure were Tizi and Froha, both places where 1 ALB had had camps in early summer 1943. More tellingly, one of the chits was headed with the name of the unit: “9 Field Company R.E. (Airborne)”. The Italian report faithfully translated this, although without the “R.E.”, which had been half obliterated by a tear in the paper. 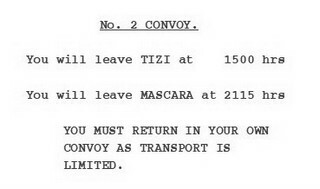 The report also carefully transcribed the times the transport had departed for and returned from Mascara, although surely this was of zero significance. Especially as the airborne troops had left Algeria at the end of June, and moved hundreds of miles to Tunisia, where their current bases were. The men were carrying 1,800 francs and 100 shillings in invasion currency. They were also found to be in possession of eight lifebelts, two cartridges, two hand grenades and, somewhat inexplicably, a “barotolo di grasso”, a tin of fat or grease. The report appended a list of the POWs’ names, some of which got mangled in the process: one man lost his surname, while Bushell became Burchell, Laughlan became Laughton, Lewis became Louis. One final name got mangled, that of the 15th British prisoner, who was not one of the 14 men from Glider Y. He was listed as John Herrick Davis. He was in fact Eric John Davies of the 2 South Staffords of 1 ALB, who was a lieutenant in charge of the troops in Waco Glider 12, which had also ended up in the sea off Augusta. From an archives point of view, this is an extraordinary coincidence, as there is only one contemporary, official account by an Operation Ladbroke POW of his time in prison, and it is by Davies. We now have both sides of the encounter at Piazza Armerina. The Italians did not manage to keep Davies long. Within 3 months or so he managed to escape from the POW camp at Capua near Naples. He reached Allied lines in time to write up his report on 27 October 1943. To see other Glider Stories, click here. This entry was posted in Glider Stories, Operation Ladbroke - Sicily 1943 and tagged 1 Border Regt, 2 South Staffords, 9 Field Company Royal Engineers, Augusta Sicily 1943, Gliders in sea - Sicily, Gliders in Sicily, Operation Husky Sicily 1943, Operation Ladbroke Sicily 1943. Bookmark the permalink.